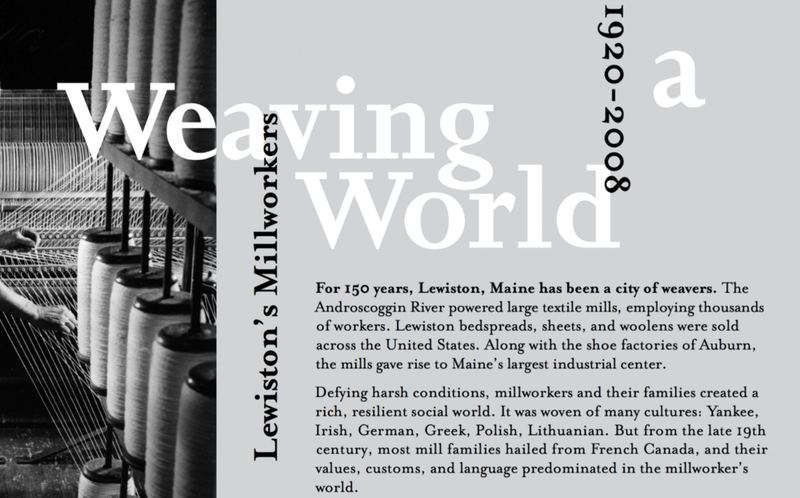 "weaving a world: lewiston's millworkers, 1920-2008"
Museum L-A was a crucial community partner during my tenure (2005-10) as Director of the Harward Center for Community Partnerships at Bates College. 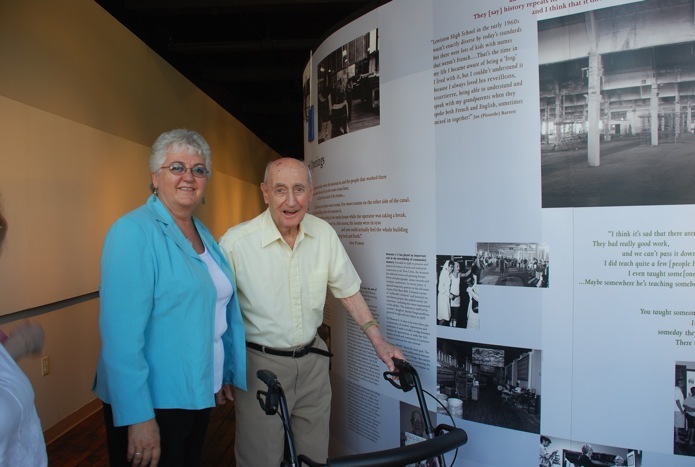 The Museum's mission of lifting up the social and labor history of Lewiston-Auburn, its commitment to grass-roots community work, and its enthusiasm for academic collaboration allowed me to pursue some of my deepest, most satisfying public work as a historian. The overall partnership is described elsewhere. 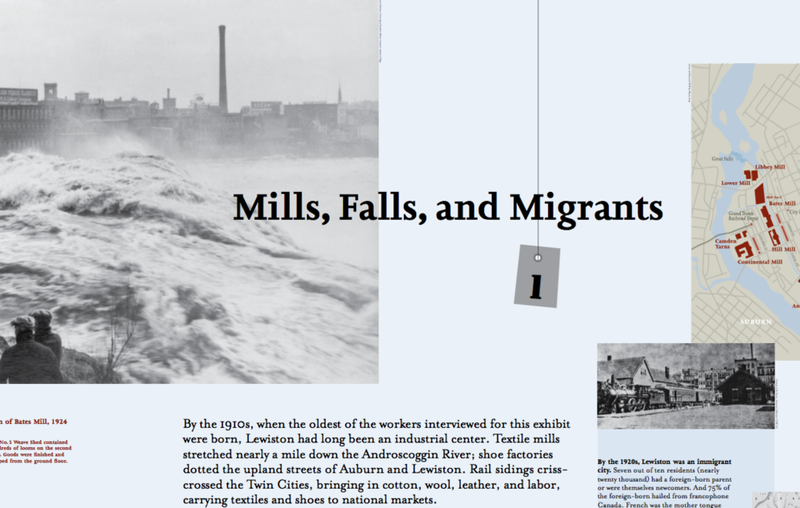 Here I focus on our most ambitious undertaking: "Weaving a World: Lewiston's Millworkers, 1920-2008," a traveling exhibition on the world of immigrant (mainly Franco-American) textile workers from the early 1900's to the decline of Lewiston's mill economy in the late 20th century. Soon after my arrival at Bates, the Museum's Director, Rachel Desgrosseilliers, suggested that we collaborate on an exhibition that could, as she put it, "show the heart" of Lewiston's millworker community. (Rachel's father, pictured with her in the photographs at right, worked as a weaver for more than three decades.) Reflecting on success of the traveling display I had done on the Underground Railroad in Michigan (described here), I proposed that we create a similar exhibition, one that could raise the visibility of Museum L-A and test its themes for a permanent collection. Museum L-A had already gathered a significant collection of artifacts and documents from the community, as well as more than a hundred oral histories of retired millworkers, most of them done by Bates undergraduates. Students in my seminar, History in the Public Sphere (syllabi, 2006, 2008), and in summer research teams, added archival research. They helped to distill the key themes and narrative structure of "Weaving a World," which were then vetted by an Elders' Advisory Committee of retired millworkers. Hannah Smotrich (a distinguished graphic designer from the University of Michigan) designed the exhibition, and I composed the text. "Weaving a World" consists of two small introductory panels and six large (eight- by ten-foot) panels, mounted back-to-back on pop-up, aluminum, concave stands. (It takes about three hours to put up and take down, and can be transported in a minivan in plastic storage barrels.) 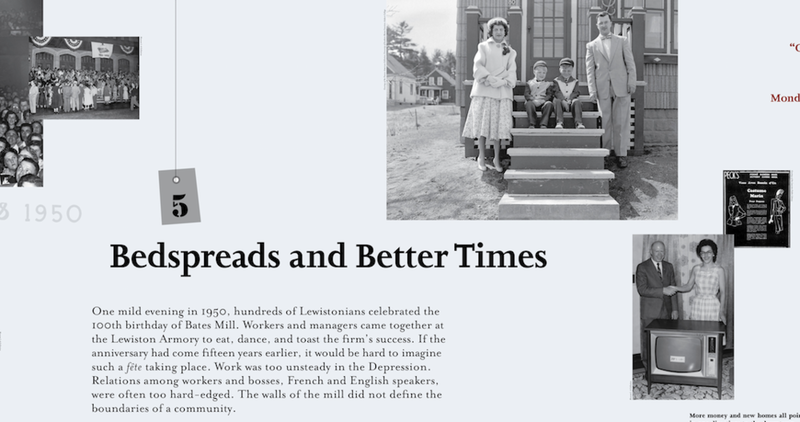 The exhibition tells the story of the growth of Lewiston's immigrant millworker community, its evolution from the hardscrabble years before World War II to unionized, middle-class prosperity after the war, and the deindustrialization of the mill economy beginning in the 1970s. Each panel integrates explanatory text with oral history excerpts, photographs, and other documents. Together they offer a portrait of communal resilience-but also a tough-minded embrace of change--in the face of hard times, hard work, and finally industrial decline. "Weaving a World" opened in Museum L-A in 2009, before touring other venues in New England and Quebec. At right are photographs of the exhibition at Museum L-A. There are links to the exhibition panels below. My article, "The Invitation" discusses the exhibition, the history seminar, and the museum partnership in detail. As I argue there, "Weaving a World" offers an important contribution to both social memory in Lewiston-Auburn and our historical understanding of 20th-century America. It exemplifies the power of recovering the past for renewing community life in the present. I believe that it models the significance of public scholarship and indeed represents some of my best scholarship pure and simple. Return to Past Projects section. As the photographs above show, the exhibition panels are quite large (eight by ten feet), and so are the pdf files. You can see zoom out to view each one as a whole and zoom in to explore the content in detail. The Chronology panel contains detailed credits about partners, researchers, and contributors to the exhibition.